DJ Longevilo is at it again! 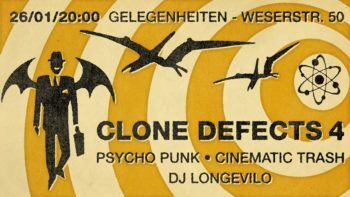 Fresh from the cloning rig comes Clone Defects #4 to please your senses with yet another wholesome dose of garage rock filth, psycho punk terror and cinematic trash grooves, all spiced up with a pinch of Gelegenheiten grit. Be scared! Be there!